ABB has rolled out a programme of training to help Network Rail’s operations and engineering teams develop skills on new infrastructure that is going into operation as part of the Great Western Electrification Programme, as well as elsewhere on the UK’s rail network. 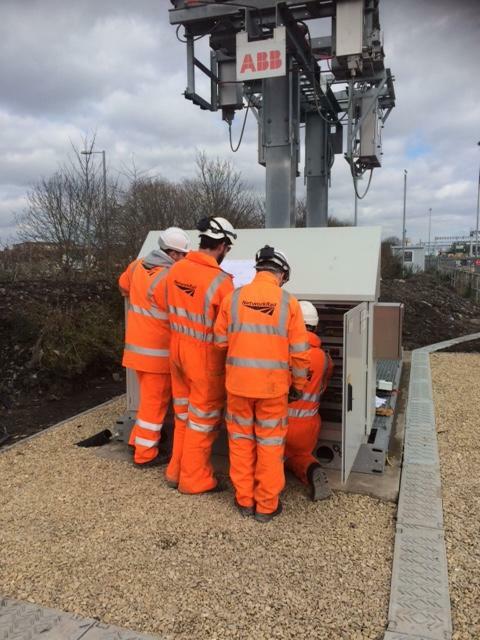 Forty Network Rail employees have received training on ABB’s Structure Mounted Outdoor Switchgear (SMOS) Light. Training sessions were held at Network Rail’s National Electrification Training Centre (NETC) at Cockleberry sidings in Swindon. Trainees have developed knowledge about the switchgear with theoretical sessions on the design and operation and by studying technical drawings and single line diagrams of substation layouts. They then put their new-found fault-finding skills to the test in practical sessions on a dedicated SMOS Light unit that ABB has installed at the NETC. It has been adapted for training with the addition of a special ‘fault panel’ that allows a trainer to simulate faults. During the hands-on sessions, Network Rail’s engineers were set the challenge of reading the drawings, operating the SMOS unit and using electrical test instruments to identify the source of the fault from a possible list of 40 faults. ABB developed SMOS Light to help operators of railway networks control risk and save time and cost during rail electrification projects. It has already been deployed on the Great Western, Gospel Oak to Barking and Crossrail projects, as well as at Hitachi’s test track at its train manufacturing facility at Newton Aycliffe in County Durham. It is designed to enable electrical engineers to create a wide array of arrangements for rail traction substations from just nine standard modules. SMOS Light has received full approval for use on the UK’s rail network through Network Rail’s Parts and Drawings System (PADS) approval. Because it is based on standard modules, Network Rail’s maintenance and operations engineers will quickly develop familiarity with SMOS Light. In turn, this will help them to deliver maintenance quickly and effectively, minimizing the duration of outages and maximizing availability of power to the lines. In addition, standardization will help Network Rail to streamline its spare parts inventory as the operator will not need to invest in multiple sets of spares that are required when the design of trackside substations is customized.